Sometimes all it takes is a simple name to inspire a design. Chateau, the colorway name of Kolláge Yarn's Sock-a-licious Yarn, made me think of lazy days on the porch of a beautiful southern home, with columns similar to those of Tara, sipping sweet tea. A Southern home perhaps because the yarn arrived with a postmark from Alabama, home of Kolláge Yarns. Notes: A cuff-down sock with written instructions that include charts specific to each size and are provided on the last page. 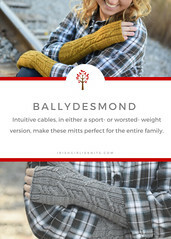 A very special thank you to my fabulous test knitters Jocelyn, Gaylen, and Madeleine! Tricia did a fabulous job on the impromptu photo shoot! And to Susie at Kollage for donating the yarn for them to knit with! Happy Knitting! Its time for Sweet Tea! So pretty! I agree with Channon - like my morning iced coffee - I'll drink it on the front porch of a large southern mansion. Mmmmmm. This is another of your patterns that could work for a man, too. It could be feminine or masculine, depending on the yarn. I would think that would be hard to design, but you manage to pull it off! Talent. I just love that color! Those socks are wonderful!! Another fantastic design!! Brava!! Congratulations on another design! I love how this pattern is not overly masculine or feminine - which means it's *perfect* for both! 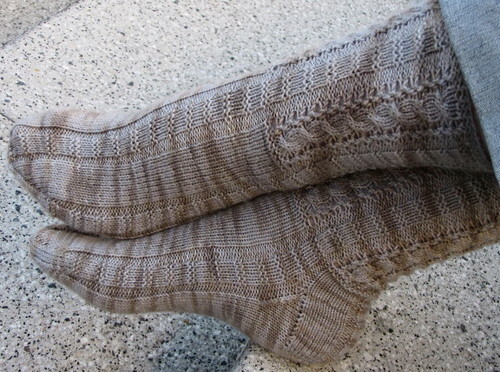 Just cast these on with Sock-a-licious in colorway Blush. Gorgeous design! I really like this sock design and the colorway is perfect!! I'm always looking for socks that can be for a man or a woman and these are perfect!